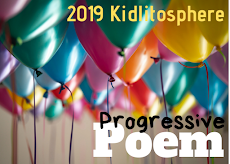 Poetry Friday is at Whispers from the Ridge with Kiesha Shepard this week and she has a beautiful poem that invites us all to step inside to sing along her "Summer Song"! 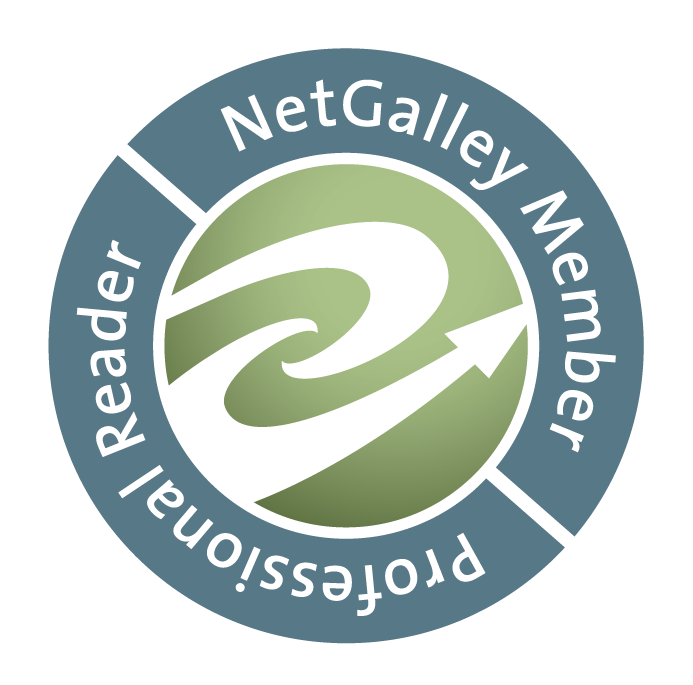 Be sure to visit to read everyone's poetry offerings! My youngest granddaughter Imogene's kindergarten class studied insects all year and I shared David Harrison's new poetry book, Crawly School for Bugs: Poems to Drive You Buggy a few months ago in this post. 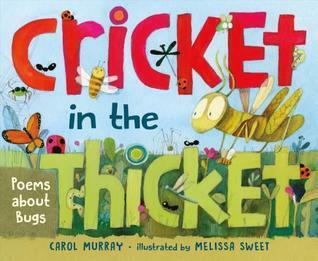 Now I've discovered Carol Murray's Cricket In The Thicket: Poems About Bugs, illustrated by Melissa Sweet. I just had a bit of time to share it with Imi's teacher and copy a couple of poems for the class, wish it had been around all year. Imi came home talking often about insect parts, knew them all, and the differences among the sexes, the work they did, and on. I was impressed, as I am by the creative way Carol has integrated what's fact with clever wordplay in her poems. Melissa Sweet's mixed-media style adds to the invitation of the book to smile and learn and enjoy these animals some think are scary! Twenty-seven different insects float, sit, fly and crawl along the pages while basking in the poems written about them. The gorgeous dragonfly becomes a "mini-glider in the sky" while those wonders of playthings, Roly-Polys, "lodge in camouflage,/all rolled up in a ball,/but a gentle nudge will make them budge,/and then they start to crawl." Also called "pill bugs", the book tells "they are actually crustaceans, like shrimp and crayfish, and have seven pairs of legs." A favorite double page shows a caterpillar, the larva of the monarch butterfly, munching on milkweed, poisonous to birds, those pretty green pods seen in the wild. The page includes a cocoon above, then butterflies flying away into the air on the right. Lucky they are! Carol writes, "Most usually, I'm hidden/when attackers choose to dine,/and birds don't like my milkweed taste. How very, very fine!" Insects on the "to-be-avoided" list of many are included, too, like ticks and mosquitos, cockroaches and termites. Carol acknowledges the harm they do in the poems but also includes quite amazing information as in Par-tick-u-lar-ly Awesome: "No wonder that the tiny tick/seems so abundant, often thick./The female lays (now here's the scoop)/five thousand eggs--in one fell swoop." I've only shared a few examples from the wide variety of insects in the book. Those beloved are there, too, the honeybee and the firefly, along with the title crickets plus grasshoppers and praying mantises. Melissa Sweet's art enhances every page, adding to parts of her collages snippets of print that have words concerning insects. It's a wonder of a book that will excite anyone who wonders about those flitting, crawling animals that are now showing themselves this spring. Here are two pages I loved and learned from. 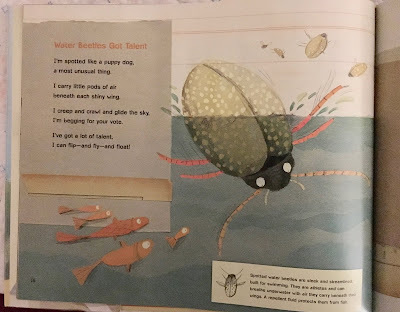 Extraordinary adaptations show off throughout the book, like this spotted water beetle who have a way to breathe underwater by carrying air beneath their wings. Carol Murray has cleverly adapted her poem to a television show you may recognize in her title, "Water Beetles Got Talent" and in the words: "I creep and crawl and glide the sky,/I'm begging for your vote./I've got a lot of talent,/I can flip--and fly--and float!" There is additional information about each of the twenty-seven in the backmatter. I imagine that any classroom would love to use this as a mentor text for non-fiction research and writing poems. It's a terrific new poetry book. This book looks great, Linda! Thanks so much for sharing it here. I was lucky enough to attend a recent library event featuring Melissa Sweet and EB White's granddaughter, Martha White. The talk was part of a celebration and exhibit of Garth Williams' illustration, but really focused on EB White. It was fascinating to hear Melissa Sweet talk about her illustrative process when creating, Some Writer, and it's such fun to see another example of her creative talent in this book. I enjoyed the introduction to Carol Murray as well. I'll be keeping an eye out for this one! How wonderful to be able to see that talk, Molly. I adored Some Writer! I have seen that there is a new display and celebration of Garth Williams, so at least I can see some online. As you can see, I enjoyed this book a lot! Hope you do, too! Thanks for sharing your experiences. LOVE Cricket in the Thicket! When I taught, I did a big unit on bugs every year - which they loved. Something about those cute little creatures! So glad that you love it, too, Vicki. Imi told me things every week about what she was learning. Clearly it's a great thing to study. Thanks! I've seen the cover of this book but haven't ventured into the pages, it's gorgeous Linda, thanks so much for your descriptions and the pages here, I'm looking forward to reading it and taking in Melissa Sweets beautiful art too! I love the spread with the water beetle–it has a personality all its own. You're welcome, Michelle. It's a 'just right' book for learning basics about the insects most of us have around us. Enjoy! Thanks, Irene, Imi & I are fascinated by insects, so this book was a marvelous addition to our reading about them, then observing, too! Thanks for the recommendation, Linda. I feel hopeless at keeping up with all the literature out there. It's fun to think about how we can shape poems to help understand the world around us. You're welcome, Erin. It is a challenge to keep up. I'm fortunate to find many books from blogging friends and from my library! Hope you find this one, a terrific view of those insects we see but often don't really "know". Loved your review, Linda!! I've been wanting to see this book and it sounds both beautiful and fascinating. Love knowing about the water beetle carrying air beneath its wings! Thanks, Jama. I loved learning about that beetle, too. Beetles, themselves, are fascinating! What a great review, Linda. Your insights add to anticipation to see the book. I love Imi's fascination with the content she learned. Carol M's word play and Melissa S's illustrations strongly add to the appeal. This is a must book for classroom investigations. Thanks for sharing. Yes, I imagine so much can come from this wonderful book, Carol. Wishing I could have had it in my own classroom! And yes, Imi still tells about the thorax, the abdomen, the antennae, etc. Thanks! Yep, it is! Glad to share it with you, Ruth. Sounds like a keeper! It looks so inviting! Thanks for the detailed review, Linda. You're welcome, Kiesha. Thanks again for hosting! 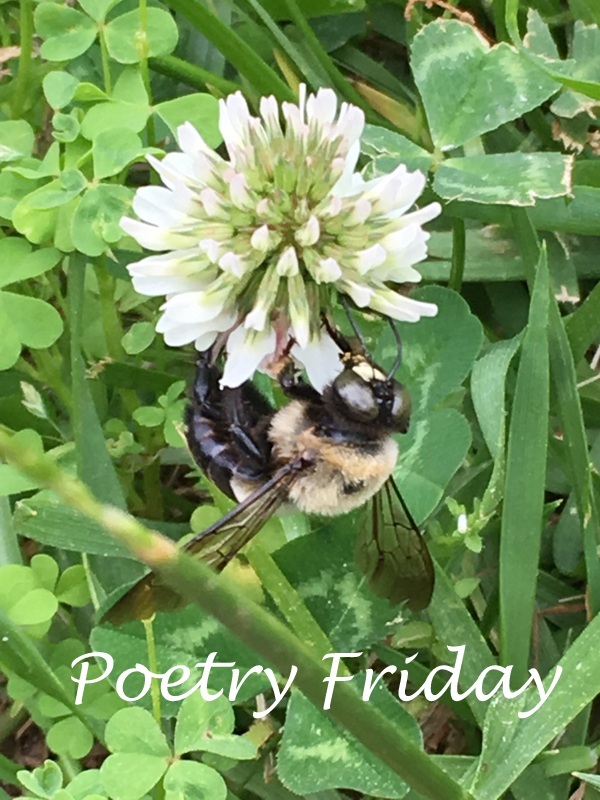 As a child I was pretty terrified of all things creepy crawly, so sweet poems like these might have helped me gain a new appreciation for all things buggy! It is a friendly introduction, Jane, even to the ones we want to avoid, like ticks. Thanks, hope you enjoy it when you can! I meant to find this book when it first came out, but it must have fallen off my list. Thanks for the reminder! Enjoy, JoAnn. I imagine you will love that butterfly page! Thank you for this review. It's just what I needed. I'm collecting mentor texts for a new project. Cricket in the Thicket looks amazing. I particularly like the poem about a praying mantis as I recently wrote one. Ooh! I'll have to keep my eye out for this one! 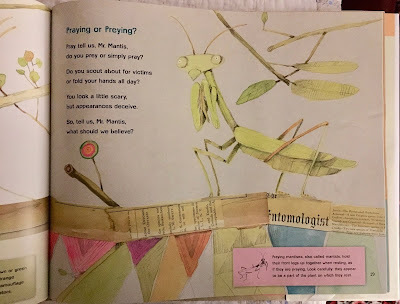 I love learning about insects and Melissa Sweet is an absolute favorite illustrator! What a beautiful book and what a treasure for one of the special young people in my life. Thank you for such a full and positive review. This is a book I need to get. Thank you, Joyce, Mary Lee and Linda. I'm glad you liked the review and hope you enjoy the book when you find it! As someone who loves the mix of poetry and science, I WANT, or maybe NEED this book. And like several other commenters, I'm a huge Melissa Sweet fan. Going to try to get it from the library so I can take a look. Thanks for introducing me to this new title! It's terrific, Carol, you will love it! Thanks! Melissa Sweet is one of my favorites, and, near the top of my list of "artists I hope will illustrate one of my books some day." I'll be writing an order card for Cricket in the Thicket on Monday! Thank you for sharing. My daughter is really digging reading poetry before bed. I will have to check this out. Even though I'm not a big fan of insects, I adore this book! Thank you for sharing it with us, Linda!